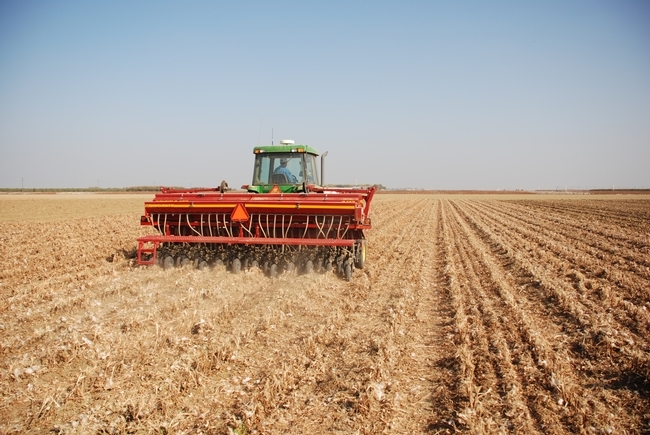 Blogger Nathanael Johnson, who writes 'Thought for food' on the Grist website, recently contemplated the impacts of reduced soil tillage on the use of chemical herbicides and crops genetically engineered to tolerate herbicide applications. He noted that the practice of tillage in farming does not mimic nature. "Nature only rarely turns the land upside down — only during disasters," Johnson wrote. "This ecosystem (soil) responds to being turned upside-down the same way a rainforest would: It falls apart." However, the author wondered whether the development of herbicide-tolerant crops has led farmers to adopt conservation tillage. For an answer, he turned to Jeff Mitchell, UC Cooperative Extension specialist in the Department of Plant Sciences at UC Davis. Garrison Sposito, professor in the Department of Environmental Science, Policy and Management at UC Berkeley, said genetically modified crops and herbicide use aren't required for conservation agriculture, but without them, yields go down. Have GMOs triggered conservation-minded agriculture? In the U.S., just a little bit, Johnson concluded. 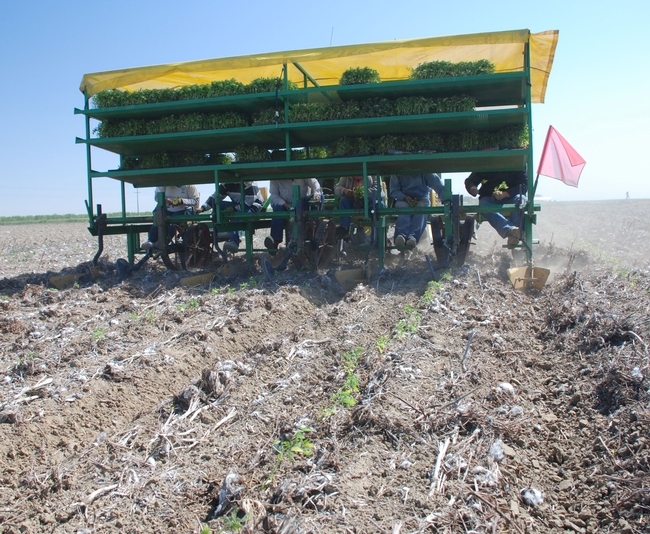 A crew transplants new crop in conservation agriculture system. UC Cooperative Extension specialist Jeff Mitchell's daily drive to work down Elkhorn Avenue inspired him to write an op-ed about what the roadway represents to San Joaquin Valley agriculture. The story was published Saturday in the Fresno Bee. Elkhorn Avenue represents the very best of our Valley and it provides a lot that we might all be proud of," Mitchell wrote. He comments on the color of soils along the route, ranging from light sandy soils derived from the Sierra Nevada to the dark, finely textured clay that formed as alluvial fans from the Coast Range. Along the 30-mile stretch he has noticed 30 different crops growing and different innovative irrigation systems - drip, micro-sprinklers and overhead systems. Mitchell says the trip also opens his mind to innovative farmers that produce crops not far from the Elkhorn throughway, such as Dino Giacomazzi, a Kings County dairy operator, and John Diener, a Fresno County innovator in biofuel production and conservation tillage, who have both won the prestigious Leopold Conservation Award.  "The future of Elkhorn Avenue's dynamic innovation thus rests with all of us. May we act wisely," Mitchell wrote. Conservation agriculture advances can be seen along Fresno County's Elkhorn Ave.
A desire to reduce fuel and water use is leading some farmers in the Central Valley to operate in new, more sustainable ways, reported Alice Daniel on KQED's The California Report this morning. For the five-minute story, Daniel interviewed Jeff Mitchell, UC Cooperative Extension specialist in the Department of Plant Sciences at UC Davis, and Dino Giacomazzi, a Hanford dairy farmer. These new farming systems, they said, aren't straight forward and require a steep learning curve. Sometimes they find themselves wondering, "What is happening out here?" Mitchell says. "And all your built-up experience base flies out the window." In the last seven years, Giacomazzi has dramatically changed the way he grows cattle feed. He has reduced the number of times he tills the field from 14 to just 2 times a year. Despite documented savings in fuel and reduction in dust emission, conservation agriculture has not been implemented widely in the Central Valley. Farmers like innovation, Giacomazzi notes, but many are reluctant to take the risk associated with changing long-held farming practices. "It's very difficult to make money farming," Giacomazzi said. "You're only going to get one shot each year to make it." Those interested in learning more about conservation agriculture systems are invited to the annual Twilight Conservation Agriculture field day, 4 p.m. Sept. 13 at the UC West Side Research and Extension Center. For more information, see the meeting announcement. Register for the free event here: http://ucanr.edu/TwilightReservation. Farmers can reduce fuel and water use and cut down on dust emissions using conservation agriculture practices. When delving into conservation agriculture production, it's important to learn the entire system, advises Dino Giacomazzi, a Hanford dairy operator who uses the process to produce corn silage for his cows. Giacomazzi was quoted in a Hanford Sentinel story that focused on research results released in the latest issue of California Agriculture journal. The research concluded that the system works effectively in a cotton and tomato rotation. In the Sentinel story, Giacomazzi urged local growers interested in undertaking conservation agriculture systems to map out the practice carefully before they start. 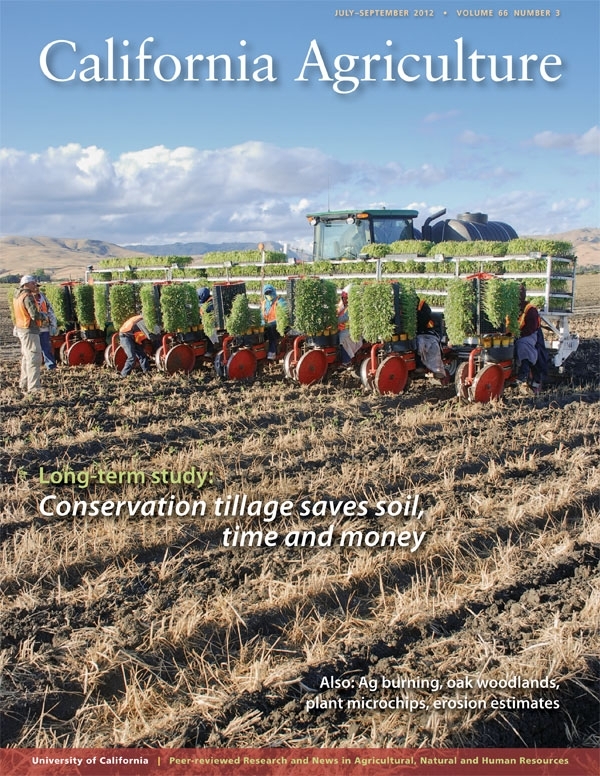 Another result of a news release about the new issue of California Agriculture journal was an editorial in the Porterville Recorder praising conservation systems. In the opinion piece, the editors wrote that they often hear farmers are not good stewards of the environment, "but that just isn't true." "One shining example of being good stewards is no-till farming, a practice that has been around a couple of decades but one that is growing in acceptance," the editorial said. University of California advisors and specialists, farmers, scientists and agriculture professionals gathered Friday in Clovis to launch a new organization that could potentially save farmers time and money, and reduce their impact on the environment, wrote Robert Rodriguez in the Fresno Bee. The event marked the establishment of the Conservation Agriculture Systems Institute, which will support research and education efforts to encourage farmers' implementation of conservation agriculture practices. The Fresno Bee story appeared at the top of the paper's Saturday business page under the headline "UC pushes conservation." 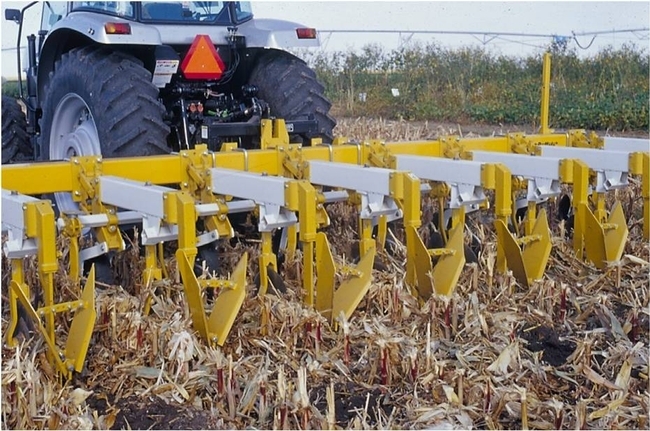 UC Cooperative Extension cropping systems specialist Jeff Mitchell said the U.S. is behind the rest of the world in adopting reduced tillage and conservation practices. But that could change as farmers face increasing regulation. "We are going to face increased demands to produce more in a way that is less damaging to the environment," Mitchell said. "This is not going to be business as usual anymore. And it's not just about making a profit; it is about optimizing yields and looking at the sustainability of our production methods." 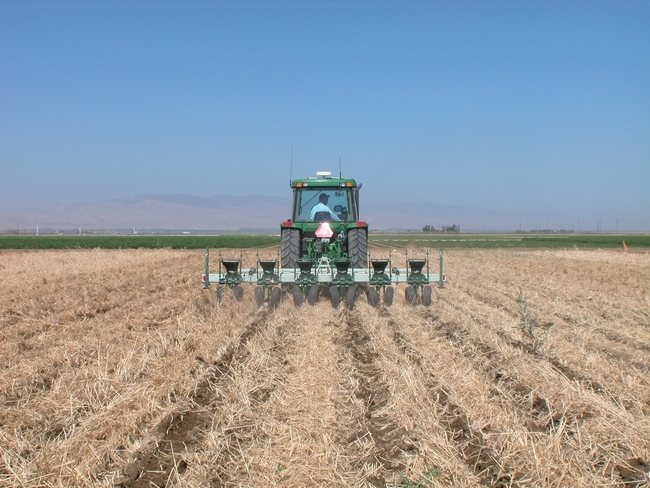 Strip tillage is one example of conservation agriculture.